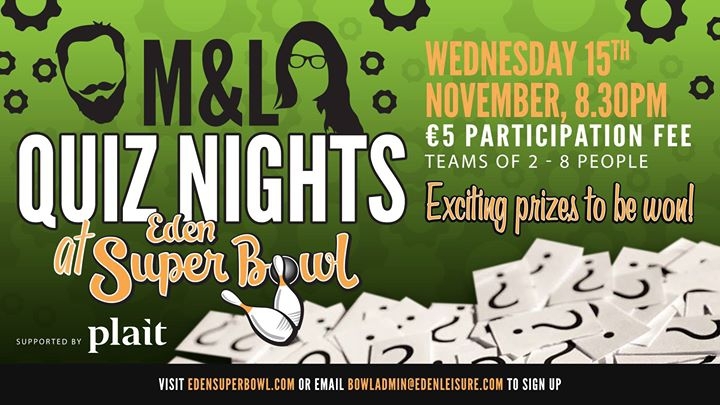 With this year’s schedule of events in full stride, Eden Super Bowl presents another edition of the very well received Quiz Nights, hosted by the seasoned Quiz Masters, M&L. Test your knowledge, have some fun, win fantastic prizes, all at the Eden Super Bowl on the 15th of November at 8.30 pm. Teams for M&L’s Quiz Night can be made up from a minimum of 2 people and a maximum of 8. Participation fee is just 5 euro per person. Put your facts to the test in the perfect setting for a fun and relaxed night with your friends or family. The winning team shall be awarded with a special gift from our sponsors Plait!